Ricki is back and cuter than ever with her side ponytail. Emily is happy to see her, I envy her nanny, that job would be great. Jef: Meet the parents This date was extremely short. I was concerned when Jef had the first date. In the past, the person who has the first hometown goes home, as example Lindzi and Ben. Kissy face, Jef will be fine. In the millisecond we saw Jef with Emily’s family, they got along well. He asked Emily’s dad for her hand in marriage, and Papa Maynard could see how happy his daughter was with Jefster. Arie: Meet the parents Arie had a disadvantage, following Jef’s date. It was a rough start, Arie didn't have flowers, but had a surprise gift in a box. He started talking, talking and it was a one-way conversation. He may have been better off to begin speaking in Dutch. Thankfully, the moment passed and everyone was relieved. He gave her family a very meaningful gift, showing he has what it takes to go the extra mile. 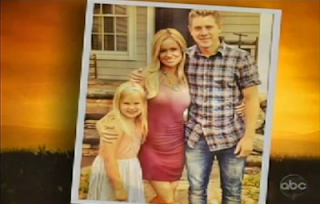 Her family was taken by Arie, like the fans. He is a genuine guy. Why didn't they give me an answer? Jef: Final Date Cue the music, private beach, this usually does not turn out well. The Bachelorette, her guy and camera crews, talk about an intimate affair. This solo date was short-lived. Jef and Emily talk about Ricki, and express concern being together without meeting her first. Emily surprises Jef, with saying he should go meet Ricki now. I was hoping Ricki wouldn’t ask if Jef was the pool guy. I couldn't remove the smile from my face, their happiness was contagious. She was able to act like Jef was just a pal, and they were hanging out. Has monkey been eating Cheetos? There is a pit stop with Chris Harrison. If he isn’t doing Bachelorette math or adding suspense, there is real drama about to erupt. Emily knows deep down in her heart what she needs to do. Chris Harrison should be a psychologist. I still feel bad about the tons of tweets the other Chris Harrison had to receive because of me. Oh no, Chris to the rescue. Arie: Final Date (sort of) Arie shows up and there is a random local lady talking about love potion. This direction was going south in a hurry, and not to Charlotte. They need a Xanax, not a love potion. I think Justin was in pain watching this, no one wants to see someone get their heart shattered. The love potion situation prolongs the situation. Emily starts crying and cannot keep her poker face. Arie looks distraught, but doesn’t seem to know what is going to happen. He thinks he is going to be with her for the rest of his life, not dumped on a bench. My hope is for him not to pull a Dougie and kiss her during the break-up chat. Arie is in absolute shock, I relate with his reaction. He is upset and heartbroken and totally needs to escape the situation. You can tell how bad Emily feels bad, and almost doesn’t want him to leave like that. He bailed, got in the car and had a classy act. Did anyone else think Arie looked good walking away? I really thought they would let him leave in a cool car, but at least she didn’t let him get down on one knee, which shows how much she respects him. I just wanted to give Emily a hug. Final Rose Ceremony: The finale place is interesting, there are buildings surrounding the spot. I understand why she didn’t want to take any chances with Arie near walls. He might just put her against one, and change her mind. There weren’t any awkward moments of who shows up first, and the infamous picking someone up from their knee. Jef shows up, Chris Harrison doesn’t have a concerned look on his face. I felt good about how all of this was going to turn out. Emily tells Jef she is in love with him. They share their feelings about each other, Jef gets on his knee and Emily has a short pause in responding to his proposal. She accepts, then little Ricki shows up, in some adorable yellow wedges. They all hold hands and walk together, my heart melted. After the final rose: My biggest issue with the live-audience was the random clapping during the episode, I was extremely happy when it stopped. I am way too ADD for distractions. There is supposed to be drama, secrets and more. First up, Emily and Arie reunite. Rumor has it they had some lingering feelings, I can some it up in one sentence. Arie was not over it, flew to Charlotte, changed his mind, called Emily and left his journal there. Emily didn’t read the journal, because it wasn’t fair to her, Jef and Ricki. I don’t think it would change her mind, but I bet it would feel like cheating. I picture Arie’s journal to be like 50 Shades of Grey (I have not read either). I flew across the country, left a journal and I'm still on this couch. There weren't any secrets, Jef was aware of everything. It really shows Jef's character that he talked Arie through the situation. They are able to manage a good friendship after this process. They are both such classy guys. Jef is moving to Charlotte and getting a separate place. This was my only fear with these two as a couple. I could not see Emily uprooting Ricki's life, and it shows how much they love each other for him to compromise. Jef has the luxury of working from anywhere, I'm glad he is taking it. How adorable is it they are going on a humanitarian trip together? Jemily may be the next Brangelina. What are your thoughts on this season? Are you surprised? Did you think the After the Rose would be more dramatic? Tweet me at @BachelorExpert or comment below. I love all of these pictures we saw of Emily and Ricki from the last few months, a lot of them Jef was there, but we are just seeing them now. Congrats Emily Maynard and Jef Holm!! The Bachelor 8 Episode 11 Finale Recap: Emily Maynard Finds Her Prince, Jef Holm is the basic plan which is shared in this article. I hope that some of the people with the knowledge of writing essay australia will develop. I like this blog so much.